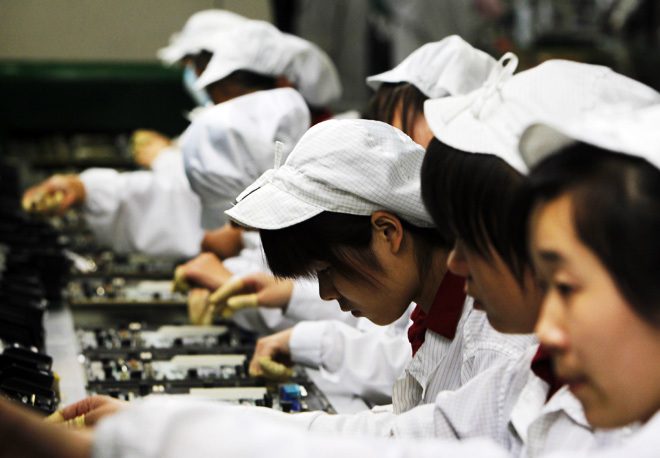 Reports are surfacing out of China that Apple manufacturer Foxconn has turned to two-month “internships” from nearby universities to compensate for a labor shortage ahead of the release of the next-generation iPhone. Shanghai Daily and First Financial Daily noted on Thursday that hundreds of students are being driven to Foxconn’s factories. First Financial Daily quoted a sophomore in the accounting department at a university in Huai’an, Jiangsu province who claims she arrived on campus at the beginning of September but was sent with other students to work at Foxconn instead of starting school. The program is meant to last two months. The paper’s reporter checked with several universities in the area and found a number of students involved in the internship. However, some students did appear to have returned to their schools, possibly because of growing awareness about the program. For instance, students from Jiangsu’s Vocational and Technical College of Finance and Economics were reportedly scheduled for Foxconn internships in three different batches this month, the first on September 3rd, followed by groups on the 10th and the 20th. The first group is believed to have already returned as a result of some unspecified trouble, but it remains unclear whether the second and third batch will be sent. Students told the reporter in an interview that they were required to sign a contract when they arrived at Foxconn. Contracts answered “no” to questions like whether the work was voluntary or whether they accepted overtime, were pulled out and required to change the answers to “yes”. According to a report from the Jiangsu Provincial Department of Education, more than 1,500 students were sent to Foxconn internships from vocational schools in the area in 2010. “MengniuIQ84 wrote that the authorities had ordered the schools to send students to assist Foxconn but said that the factory neither informed parents nor signed agreements with students. China National Radio reported that teachers have told students that the internships were required to graduate and would help them “experience working conditions and promote individual ability.” An unnamed official acknowledged that the practice is a common occurrence. “It’s hard for students to find jobs which are precisely related to their majors. Therefore, they are encouraged to go to factories to learn more about society,” he reportedly said. Foxconn came under scrutiny earlier this year after multiple reports of worker violations at its facilities surfaced. In February, Apple asked the Fair Labor Association (FLA), which got its start auditing garment factories, to check up on Foxconn. The FLA found a number of issues at the manufacturer’s plants, including wage and overtime violations. Apple CEO Tim Cook took a tour of a Foxconn facility in March. Foxconn has long had a short-term internship program that we carry out in cooperation with a number of vocational schools in China. Participants in the internship program, all of whom are of legal working age in China, represent an average of 2.7 percent of our workforce in China. The internship programs range in length from one to six months and students are free to leave the internship program at any time. While we provide vocational schools with our qualification requirements, it is the schools that recruit the students under the supervision of the relevant local government and the schools also assign teachers to accompany and monitor the students throughout their internship program. In addition to allowing the students to gain relevant industry experience while earning the same industry-competitive compensation as our full-time entry-level workers, this program gives Foxconn an opportunity to identify participants in the internship program who have the potential to be excellent full-time employees should they wish to join our company upon graduation from their vocational school. A recent audit of three of our facilities in China carried out by the Fair Labor Association confirmed that there was no evidence to indicate that any of the interns were pressured to participate in or to continue to participate in any internship program. A previous audit by the Fair Labor Association confirmed that students find their participation in this program valuable and that the positions offered by Foxconn were at compensation levels equivalent to entry-level full-time workers.